There’s a great television ad where the husband tells his wife he got them a special “his and hers” gift and they head outside to the driveway. A bright red, full-size SUV and a black, four-door pickup are waiting as Christmas presents. The expectation is the wife will pick the brightly colored SUV. 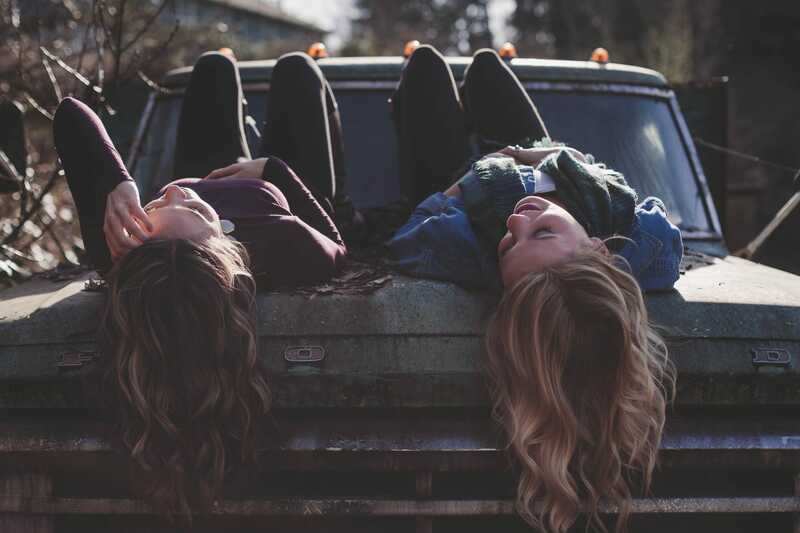 A pickup truck can haul around everything from soccer players to landscaping supplies to sheetrock for a new room addition or an ATV for off-road racing fun. Problem is the interior is designed for driver and passenger comfort, not for storage of stuff to keep it secure or protected from the elements. Why do You Need a Tool Box for Your Truck? A truck is great to throw the big items in the bed to haul from here to there for offloading – bags of mulch from the store to your home’s front yard, for example. But what if you always need stuff with you – like work tools – or you’re constantly hauling passengers around – like your trombone-playing, soccer-star daughter – and all the accompanying musical and sports gear? That kind of stuff left in the truck bed is easy pickings for sticky fingers when you stop at the store on the way home from the concert hall or soccer field. If your truck is for work, tools left in the bed will disappear faster than free tacos at a construction job site. You need a way to keep passengers comfortable without cramming stuff from the bed into the truck cab every time you make a stop. You can eliminate this hassle with a truck tool box or tonneau bed cover. There are endless combinations of these add-on accessories for your truck, so let’s review some options to help you decide which may work best for you. I’m going to jump right into these reviews because truck tool boxes are ready-to-go additions for anyone who owns a pickup truck and needs to secure items while also keeping the truck bed available for use. This tool box is top of the line from the moment you set eyes on it and gets better when you open it up. The Brite-Tread aluminum design provides a light-weight toughness that can hold up to tossing heavy tools into it. Stainless steel handle latches and the aluminum frame fight rust and provide lasting durability. It also has a plastic tray inside for easy access to those “always have” tools, such as a favorite screwdriver, knife, or soccer ball pump. Smaller loose items will surely collect here, but that’s often a good thing when you need a few screws or nails or maybe a tube of silicon in a pinch. I like the lid of this box because its piano hinge opens over the entire length of the box so longer tools can be placed inside easier from one side of the truck. Adding to the easy access are the dampened the two gas shocks that keep the lid upright when open and help raise the full lid with one hand once the latches are unlocked. There is also a closed-cell foam gasket for the lid to help keep out wind and rain. The less weather elements getting inside the box, the better. Locking the box is straight-forward with a key in the one handle. It comes with mounting hardware and instructions. This is a crossover tool box, so it is going to rest on the bed rails on either side. It rises above the bed rails by about 6 inches, so you’ll lose some visibility in your rear window. Better Built is an original in the world of tool storage and has one of the best, longest-lasting reputations on the market. This crossover tool box has a low profile so it’s not going to block as much of your rear window view. Less than 2 inches of the box rise above the truck bed. This aspect works well for smaller trucks. There is a lot to like about the stylish design for compact or full-size trucks. The Brite-Tread aluminum construction offers the durability and rust resistance expected for a tough tool box. Welded seams provide solid construction to hold up against daily use with tools and battling heat and cold. I love that this tool box can be ordered in a wedge design to work around wheel wells and that there is a deep design for added storage space to handle larger items. This is a great option for sports equipment or tools that just won’t scrunch into smaller boxes. The full-length lid has gas struts to keep the lid open and ease it down when closing. This tool box stays locked with the handle latch improved to offer more security. A key opens and locks the box and the latch system opens easily. The overall weight of this tool box is surprisingly lighter than expected considering how much storage space the box provides. Less weight helps if you're stuck installing this by yourself. Be sure to buy appropriate installation accessories for this box! I’m throwing this box into the mix because sometimes you just need more space for tools and gear. Face it, we all collect more “stuff” than expected, so the UWS side mount truck tool box can be used alone or, more likely, in addition to your current truck tool box. A pair look and function great together, as well. The box rests over the side bed rail. It comes in varying lengths with enough depth and width to add significant storage space. A single, stainless-steel paddle handle with key lock adds security for your belongings. The lid is full length and has a patented RigidCore, foam-filled design to keep out dust and water. This core also adds strength to the box. The lid opens to a full 90 degrees and has self-opening struts for hands-free operation. Thick aluminum adds structural strength to handle wear and tear inside and outside. UWS boxes are also made in the USA. I’m impressed with the long-lasting durability of UWS truck boxes and the convenience options this box provides as soon as it’s delivered. This might be the storage solution you're seeking if you want convenience and accessibility for a variety of uses. 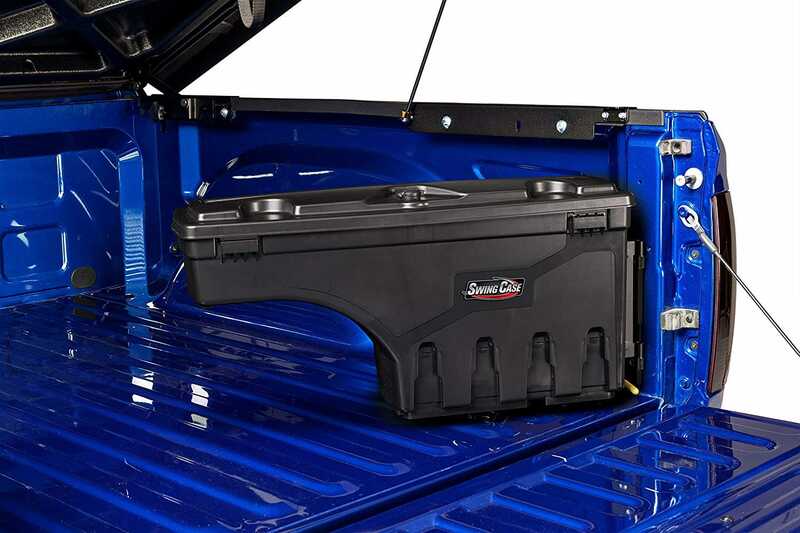 The UnderCover SwingCase truck box is designed to fit into your truck bed from the tailgate to the wheel well. I like that these boxes are easily attached with supplied mounting hardware and can be used on the driver side or passenger side of the truck. Constructed of lightweight, heavy-duty plastic, these boxes can hold more than tools, including sports gear, fishing tackle, or even hunting supplies. UnderCover rates these as holding up to 75 pounds of tools and supplies. Some customers brag about using them for ice and beverage holders, because with cup holders are molded into the top of the boxes, they're perfect for tailgating! These are unique tool boxes because they have a mount that allows them to swivel toward the tailgate. This provides easy access without having to climb into the bed of the truck. Each tool box also features a quick-release latch, so it can be quickly removed and carried on location as needed. UnderCover boxes are designed to fit under tonneau bed covers but can just as easily be used without a cover. The boxes can be locked with or without the key and have a bracket that can be secured with an extra padlock to prevent theft of the box. This is one of those items where you’ll find yourself wanting two just to cover all your bases for storage (or maybe cold beverages) in your truck. This truck tool chest is lives up to its calling – it’s durable, inexpensive, meant to hold tools, and portable. Yaheetech’s tool chest sits in the bed of your truck and delivers these features in the corrosion-resistant aluminum construction. I like the durability of this box, but it’s not what I would use to store more valuable items such as high-price tools or sports equipment. It has a lock and latch, but the overall construction doesn’t seem as secure as pricier truck tool boxes. Among tool chests like this, the Yaheetech has an overlapping lid design with a seal ring that works to keep out dust and moisture. Most tool chests in this price range do not have this feature. This is certainly a benefit if you need your cargo to stay dry. There are handles on either end of the chest for moving the box in and out of your truck bed, too. Its design allows you to secure it to the truck bed or keep it portable as needed. It fits nicely under most soft- or hard-cover tonneau bed covers. I could see this tool box used regularly for construction work, trailer and camping equipment storage, or bulkier sports equipment to and from the field. 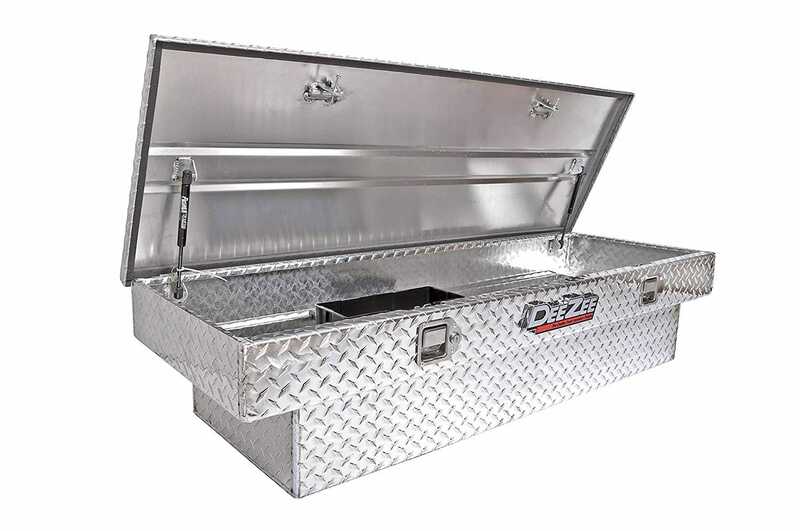 Popular truck tool boxes include crossover bed boxes and tool chests. Crossover bed boxes are the more common truck tool boxes. These extend from one side of the truck bed to the other, crossing over the bed, and rest on each side of the bed rails. Types of crossover boxes include the typical box with a lid across the full length that opens toward the truck back window. Some have dual lids that open the same way and separate the box into two sides, each side with its own lock. Other boxes open toward the center of the bed from either side, providing easier access over the rails of the truck. Since crossover boxes rise above the height of the bed rails against the truck cab, they tend to block some visibility through the rear window. Low-profile crossover boxes limit the obstruction to some degree and may be the better option for you. Another plus for crossover boxes: they don't take up the full height of the truck bed, which lets you still easily store materials or tools the full length of the bed if needed. Choosing your crossover box depends on your level of comfort with each style. 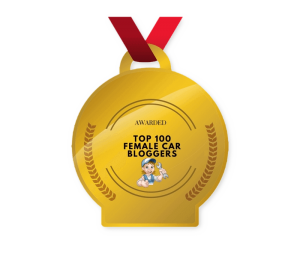 The key to selecting this box is how often you’ll be retrieving or placing items inside. Often, it’s more preference than practicality. These boxes provide needed storage space that can be locked for security. By comparison, a tool chest can have more storage space because it rests on the bed of the truck and can be a wider, deeper box. While they can be bolted to the bed of the truck, tool chests are commonly portable so tools and supplies can be moved to a location as needed. 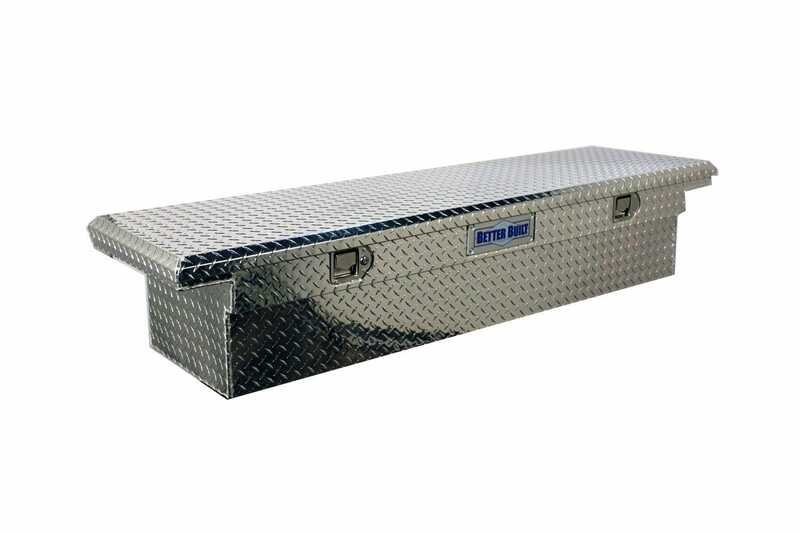 Because they are larger, tool chests take away more space in the length of the truck bed that might be used for transporting equipment or materials. For larger trucks with extended beds, this is less of an issue. Another advantage of tool chests is that they can be used in conjunction with a tonneau cover. The chest fits nicely underneath the cover which provides added protection from the elements and potential thieves – out of sight, out of mind. Determining how you will use a truck tool box versus a tool chest will help decide which to buy. It makes sense for most truck owners to have the crossover tool box unless there is a need to move the box out of the truck. How you use your truck daily is going to be a big consideration in deciding on a truck tool box versus a tonneau bed cover. Does your daily routine consist of loading and unloading work tools and supplies to use at job sites? For you, a tool box might work best. Do you commute daily to work and only occasionally use your truck to haul home improvement material or sports equipment? Then a tonneau bed cover may better suit your needs. 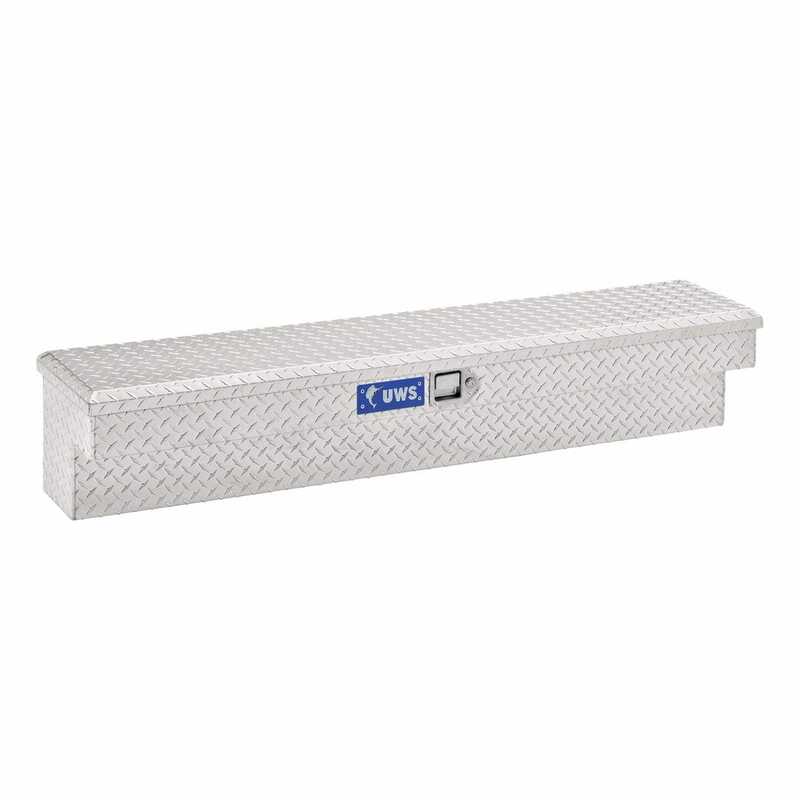 A truck tool box is designed to hold tools or gear. It provides security for possessions from theft while protecting items from the weather. Cargo left in the truck bed – especially power tools – can take a beating from sun, wind, snow, or rain. Any tools with an electric power supply won’t do well when left to suffer the elements. Tool boxes are designed for durability to hold up against the inevitable rough use from storing tools to and from job sites. 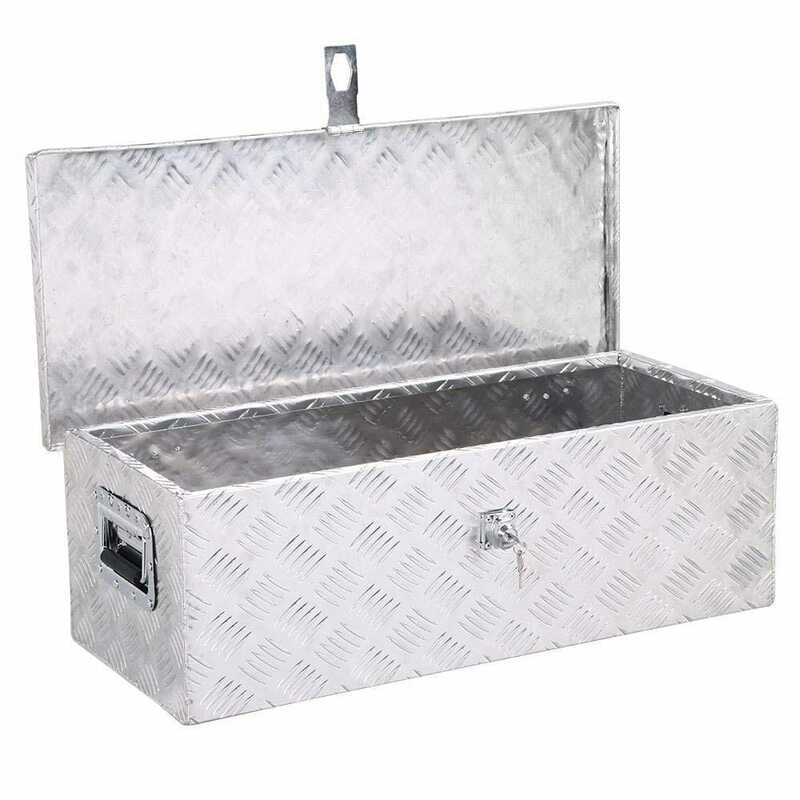 Best-in-class boxes are made of steel or anti-rust aluminum with key locks and stainless steel handles. Plastic tool boxes offer an inexpensive option for many trucks but may not hold up as well over the long haul depending on how you plan to utilize your box. Security is probably the most important consideration for a tool box. Truck owners want a secure storage option other than the open bed of their truck and truck cab. A strong box is a deterrent to thieves, as it would take more time and care to open. Knowing whether it will be used for work or play is a big factor in how much you want to spend on a truck box. If you just need some extra storage space for gear to and from the sports field or the lake, then a modestly priced box that can be locked may be a good option. 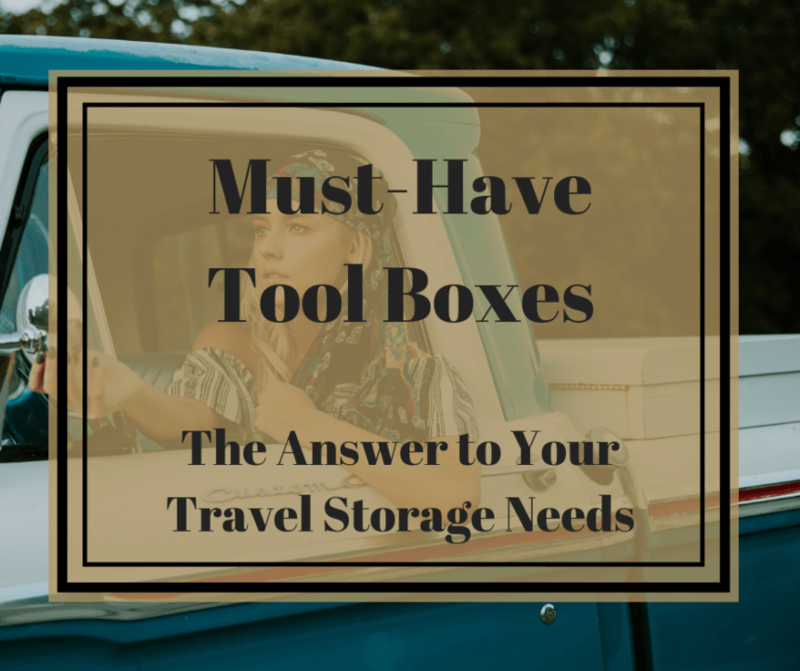 If you and your tools practically live in your truck, it may be best to invest in a well-built box with strong locks that can be bolted to the bed of your truck. Truck tool boxes are a great way to keep equipment organized. There’s nothing like the frustration of being on a job site and digging through the disarray in the bed of your truck just to find one tool you need. I also don’t want my misplaced lucky fishing lure hooking me when I reach for my power drill. If all is kept in order inside the tool box, the fishing expedition is more fun, and the hooks are used on the fish, not me! 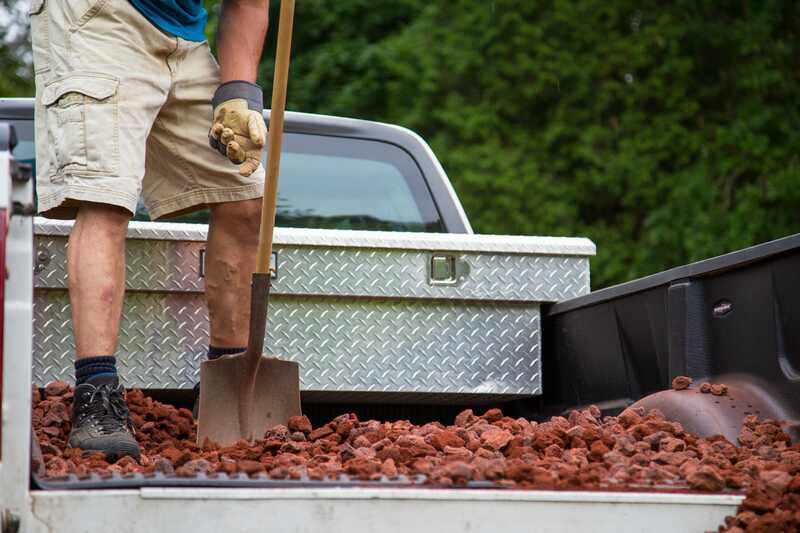 While a tool box may take away space in the truck bed, it doesn’t eliminate all the room for hauling larger equipment or supplies. Boxes are designed to maintain as much room as possible after installation. An added element of a truck box for professionals is the image a quality box conveys to potential customers. A bunch of valuable tools and supplies rattling around in your truck bed as you drive up to meet someone doesn’t say, “I’m a professional.” A sharp-looking, well-constructed tool box shows you are serious about your trade and committed to quality work. It’s an image, but it can help build confidence with customers from the start. An alternative to a tool box is a tonneau bed cover for your truck. I know this sounds like a broken record, but which one is best for you depends on how you use your truck. 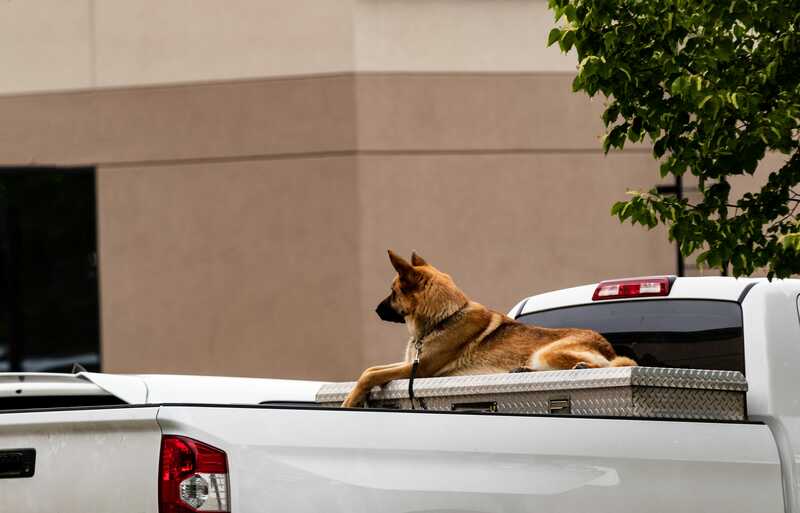 A tonneau bed cover simply encloses the bed of the truck and offers varying levels of protection against the elements and security from theft for whatever items you’re hauling. Tools, luggage, camping supplies, sports accessories, fishing tackle, or hunting equipment can all be hidden from sight and avoid the weather. 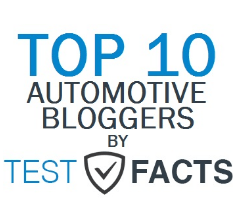 There are arguments that bed covers increase gas mileage and save on fuel costs. I’ll leave this as a possibility that likely won’t be proven until you experience it yourself. Protection, security, and gas savings are practical benefits of bed covers, but not likely the reason for most purchases. A top reason for a bed cover among truck owners is they make your big ride look even better than expected. An open truck bed has a dull appearance while a bed cover adds an element of style and sophistication for even the most used work truck. Tonneau bed covers can be soft-folding, hard-folding, retractable, or roll-up. High-end covers can be painted to match the factory color of your truck. I know truck owners who wouldn’t dare let their truck beds get dirty, so a bed cover is a must for them. Many truck owners I know want the security and protection of a bed cover and style is an added benefit, but not necessary. Without picking a specific box or cover, I will suggest being diligent about choosing based on durable construction, strong locks, and not being afraid to spend a few extra dollars to buy the best-in-class option. 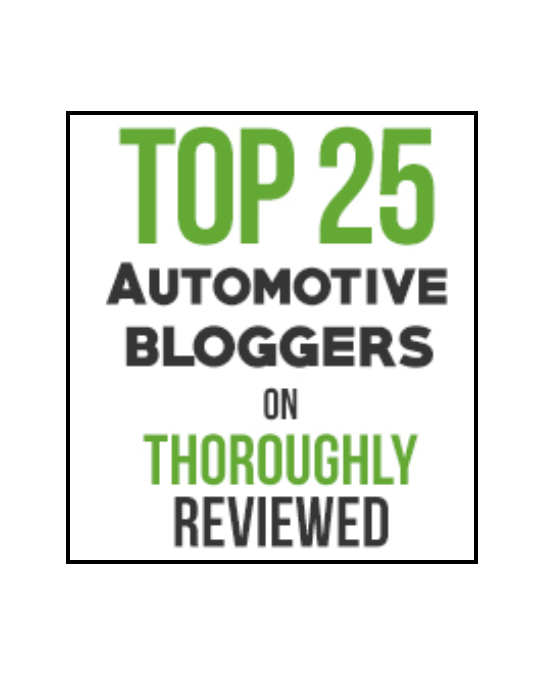 You’ll want your truck tool box or tonneau bed cover to last for years, so review how you use your truck and then follow the above reviews and guidelines to decide what works best for you. Thanks for sharing this information. It was quite interesting to read about the 5 must-have tool boxes for trucks. It was really useful and knowledgeable. Great work keep going. Thank you.